(c) suddenly dealing with the worst body hair problems he's ever had. As a human, Lucas is agile and cunning. Wolf Lucas would rather smash anything in his way. Only by transforming between the two forms and cleverly utilising both sets of skills will he stand any chance of lifting his curse. And with the city's most powerful billionaire after his blood, a jaded Private Investigator on his (now-literal) tail and the rent long overdue, he'll need every ounce of ingenuity he manage.Along the way he'll need to befriend a hilarious cast of characters, convince the city its most beloved citizen is a terrifying criminal mastermind, and hardest of all, teach his daughter it isn't funny to fill the fridge with dog food. From the award-winning indie developers behind Jolly Rover (Australian Game of the Year, 2010 Freeplay Awards), MacGuffin's Curse is a story brimming with humour, personality and heart. ■Friendly for all players - Enjoy a quick, fun logic puzzle fix, or lose yourself in a sprawling full-length cartoon adventure. ■150+ Puzzle Rooms - Inspired by classic top-down console adventures, these increasingly mind-bending challenges will push your logical thinking skills to the limit! ■Challenge Without Frustration - Stuck on a room? P.I. Strump is on the line to help you along (at least between thinly veiled insults) with a seamlessly integrated hint system. ■90+ Sidequests - Meet the colourful nightlife of Feyre - a carnival city under curfew - and earn their trust with bizarre, legally questionable favours! ■Charming Hand-Drawn Art - Collect 50 lavishly-illustrated comic panels to piece together - each expanding on the scandalous secret backstories of key characters! ■Razor-Sharp Dialogue - With witty banter straight the golden age of point-and-click adventure games, you'll want to chat to every stranger and examine every park bench! ■Insanely Catchy Soundtrack - From spooky strings to acoustic gypsy power-rock, this fun, upbeat score is destined to have you humming along! ■Extensive Replay Value - Post-game challenges, hidden easter eggs, unlockable comics and developers' commentary will keep you coming back long after the credits roll. Thanks to fan AuldWolf for helping to track these bugs down, you get yourself a space in the credits! Halloween bundle is packed with spooky games feat. Sam&Max Devil's Playhouse, Home, Pathologic, MacGuffin's Curse & EvilQuest. Help Lucas MacGuffin sneak and smash his way through this fiendishly addictive comedy-puzzle-adventure. 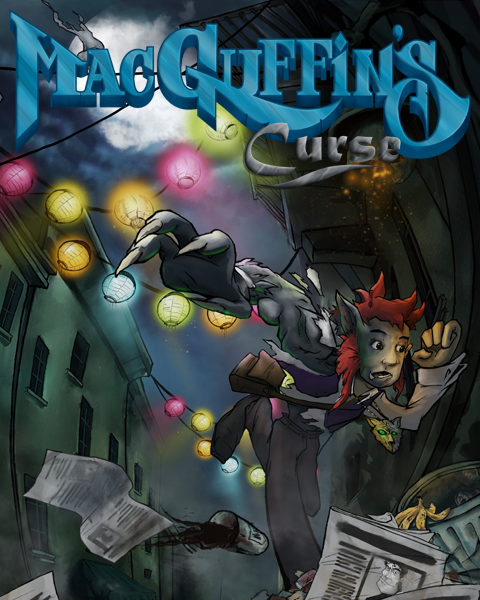 A release date for MacGuffin's Curse has been set - April 19th, 2012. Be sure to mark your calendars! The Official Trailer for Brawsome's second award winning title - MacGuffin's Curse, was released today to coincide with the launch of its IndieDB page. I did try to get into it but something threw me off half way though.. Looking back, it was the design i did not like, gameplay wise it was a fair puzzler though. Got this in the haloween bundle. Nothing really grab me as far as the gameplay is concerned. The humor is not my cup of tea either. I can see young people really playing this game. i think I am just too old for it. Seems to be a bit slower paced as far as the gameplay. Animations are on par, or better then most of the indie stuff out there. Seems like nicely done artwork, and the sound acting seems OK. Nothing at all bad that i can see so far. I guess it is just not really my sort of game. Hmm, this vanished for a bit earlier today.